This is just a summary of our trip from Manila to Tokyo and vice versa. 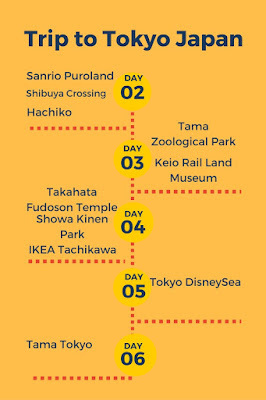 Just to give you an idea, on what to expect or how to travel to Tokyo, Japan. Japan is on my bucket list so I was really glad when our visa were all approved. I immediately checked the available flight for our schedule. 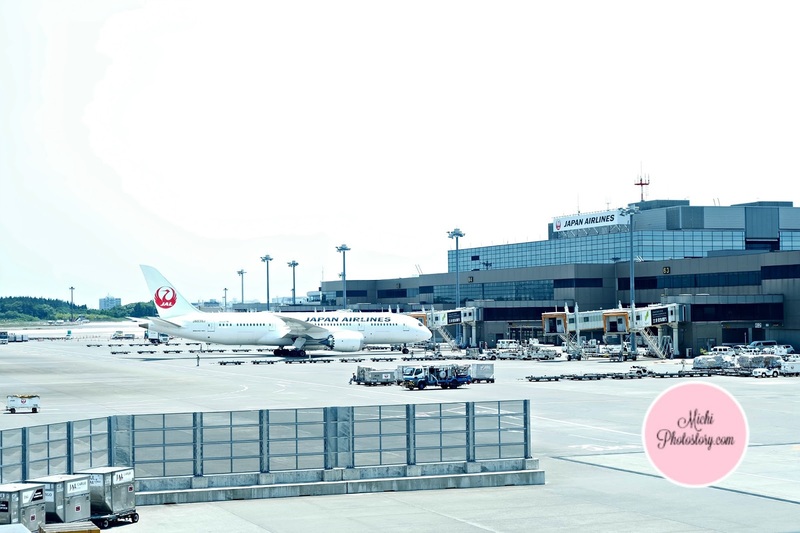 You can choose Narita or Haneda airport if you are going to Tokyo, Japan. 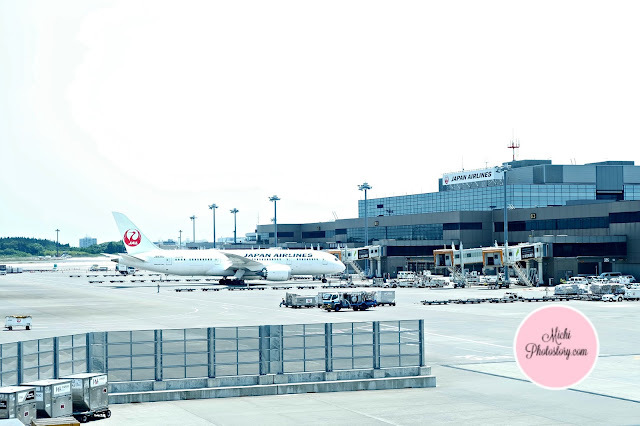 I chose Narita because the flight is earlier but I realized that I should choose Haneda because it is near to Central Tokyo so travel time to Tama Center would be shorter and fare would be cheaper. Time: 120 - 145 min. Time: 80 - 120 min. We left at 2AM in the morning for our 6:30AM flight. 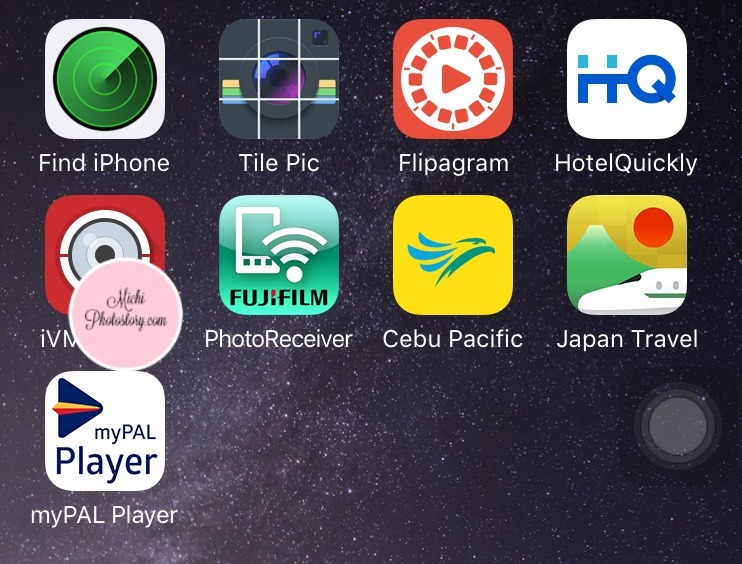 Before boarding, we downloaded the myPAL Player for our in-flight entertainment but we were so disappointed na hindi siya available sa flight namin. Waah! 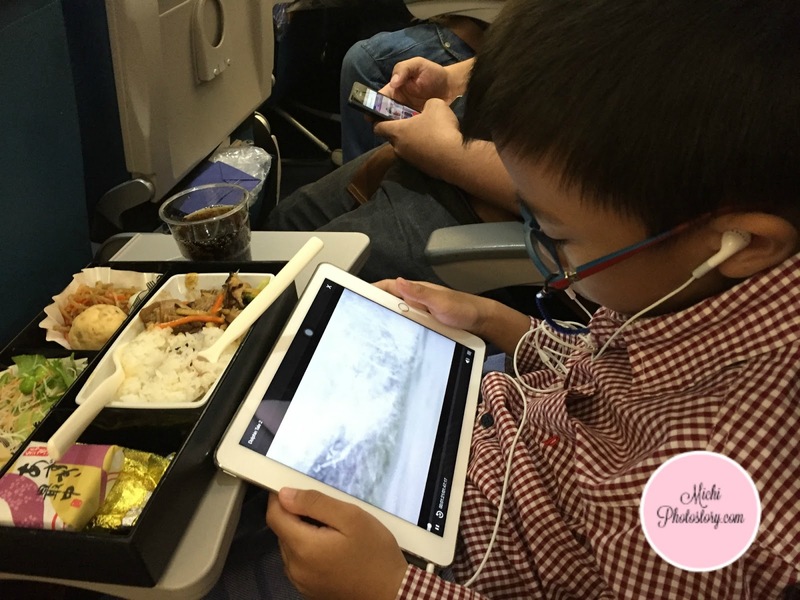 It was really a long flight for my son, I did not bring his Ipad pa naman para less bitbitin. Anyway, I was glad that they served the meal for kids first so no more long wait for them. There were only two choices so we chose both meals. I thought we have an ice cream for dessert just like our Singapore to Manila experience but no ice cream for us, fruits lang ang dessert. Hehehe! So every flight is a different experience. Then we got our luggage and went to Airport Limousine Bus Ticket Counter. We landed at 11:30AM and the next schedule of shuttle bus is 2:50PM. Waah! 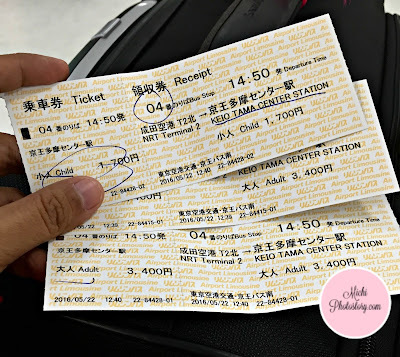 It was really a long wait so no use ang early flight namin, sana nag-Haneda airport na lang kami. 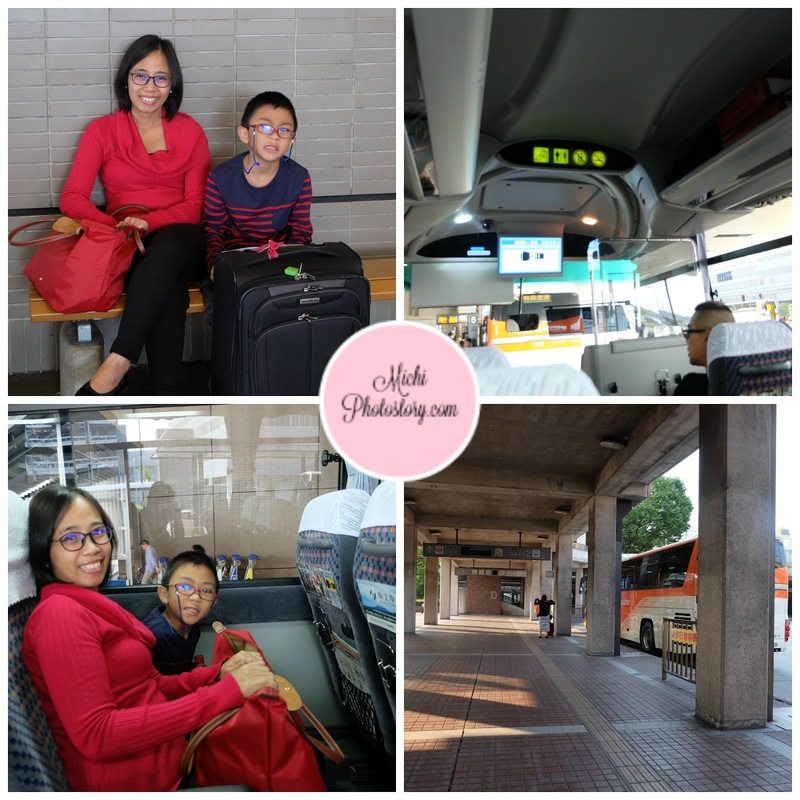 We enjoyed our time na lang, people watching while waiting for our airport shuttle bus. Then we fell in line, parang airport din. They put a tag in our check-in luggage and you need to show it to get your luggage. The bus is clean, spacious and you need to fasten your seat belt. It is almost 2 hours ride from Narita airport to Tama Center. 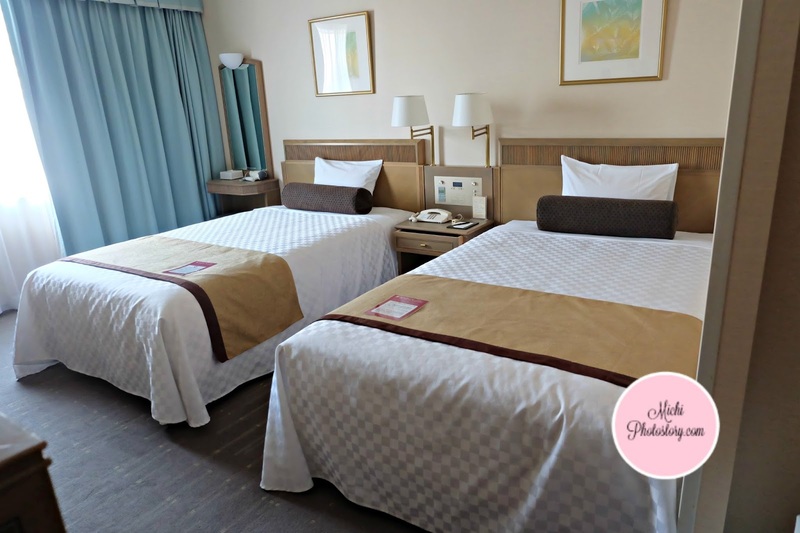 After our long travel, we finally reach the hotel (Keio Plaza Hotel Tama) which is just 1 minute walk from the bus station. After 6 days of vacation we have to say goodbye to Tokyo. 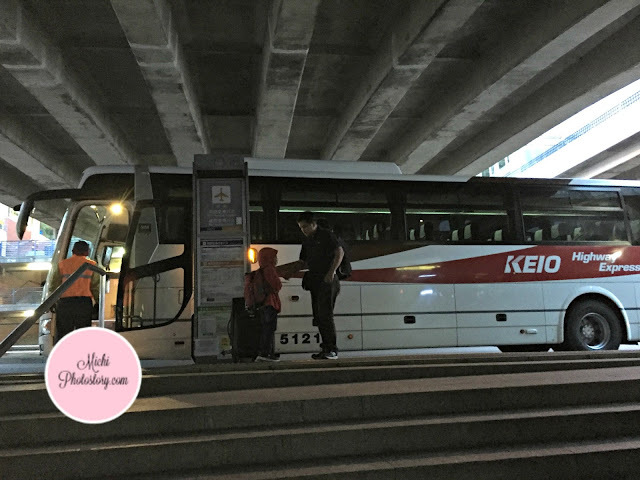 We bought our Airport Limousine Bus Ticket at the hotel and there was no extra charge. We just made a reservation and you can pay upon check-out. They gave us the tickets and went to the Bus Station 16 as early as 4:30AM for our 5:10AM schedule. Again, almost two hours of travel so we just slept in the bus. 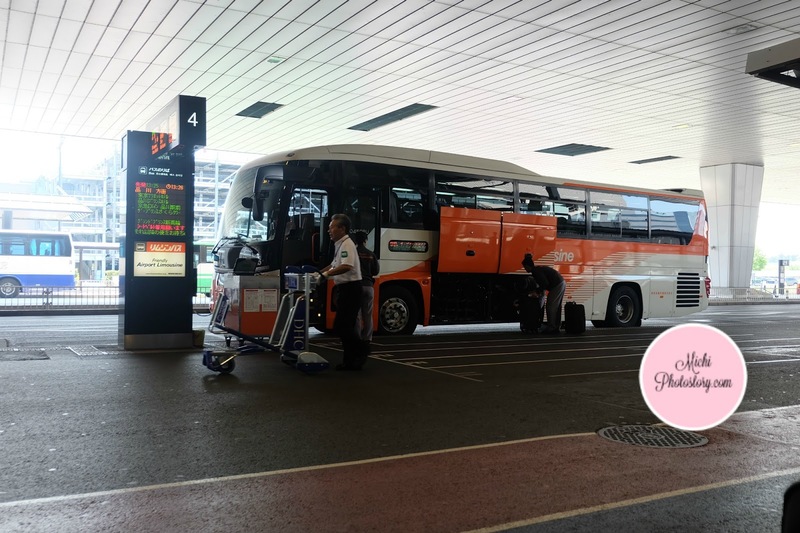 We were thankful that we arrived on time because our flight is 9:30AM, di yata uso traffic sa Japan. Hehehe! We checked-in and went to immigration, on our way to immigration I was nervous because airport staff picked-up my hand carry bag and brought it into inspection table. Kinabahan talaga ko kung ano yung nakita sa bag ko, yung Japanese curry (in sachet) lang pala ang salarin. Bawal nga pala yung liquid and nawala sa isip ko na liquid yung Japanese curry. Pinagsama-sama ko lang kasi sa isang bag lahat ng pasalubong. 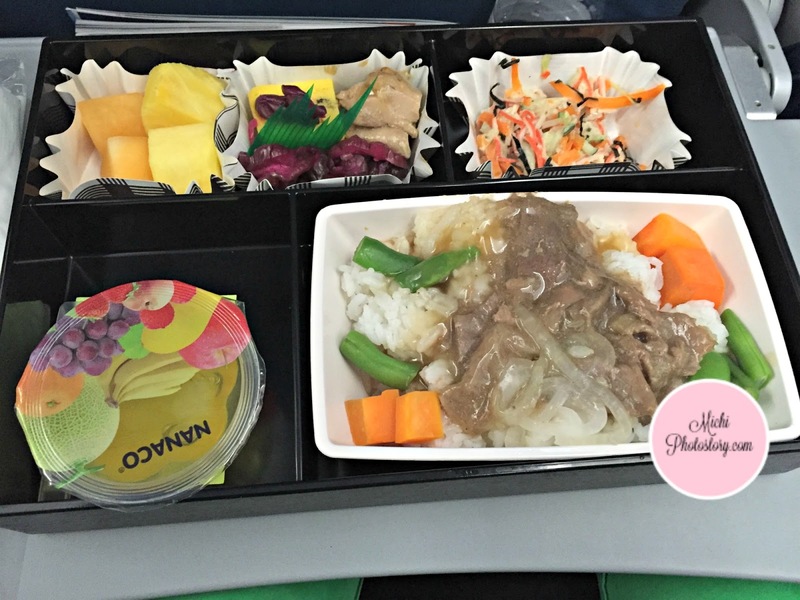 Grrr, sayang yung Japanese curry. Lesson learned, check maigi ang handcarry bag. Then after immigration, I bought Royce Chocolates. Ang sarap mamili kung marami lang pera. Royce Chocolates are really affordable here in Japan pero ang mahal sa Pinas. Panic buying ang iba but I only bought 3 kinds of Royce Chocolates para makatikim lang ulit kami. hehehe! We did not wait long, boarding na agad kami and we’re so happy because this time we can watch movie. Yehey! My in-flight entertainment na. I also noticed that PAL doesn’t provide headset na noh so better bring your own earphones. I watched “Everyday I Love You”. 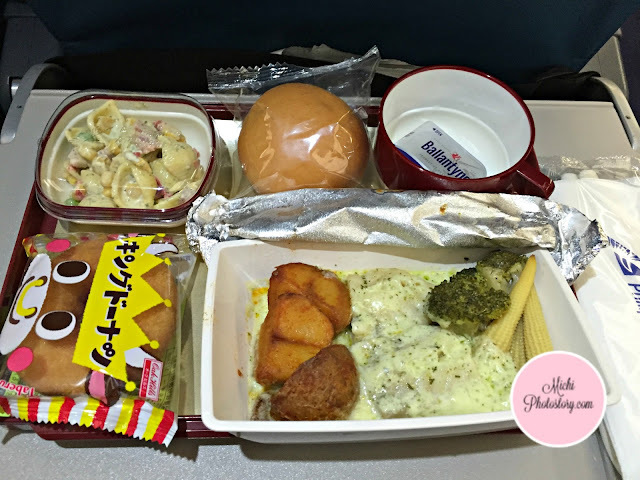 These are the meals from Tokyo to Manila, my husband did not like the Poached COD. Buti na lang beef order namin. Hehehe! We really had a great time in Japan and I’ve learned a lot in this vacation which I will share in my upcoming post. 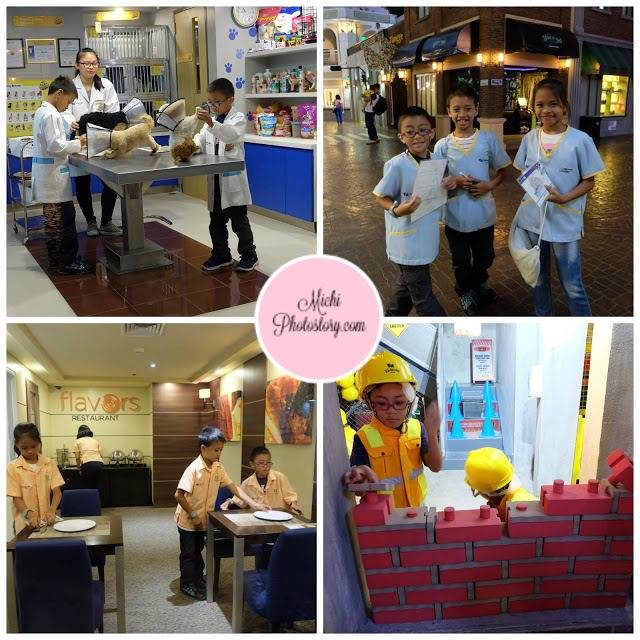 Last year, I was excited when I learned that Kidzania will be opening in the Philippines because I know that my son will have fun doing those activities. I even joined in their giveaways and got some stuff. But when I asked my son if he wants to go to Kidzania, he said no. Ethan: I don’t like that! I don’t want to work! I can’t do that! Me: No, that’s not difficult. They will teach and train you how to do the activity. Remember when you grow old, you really need to work to provide your needs and wants. 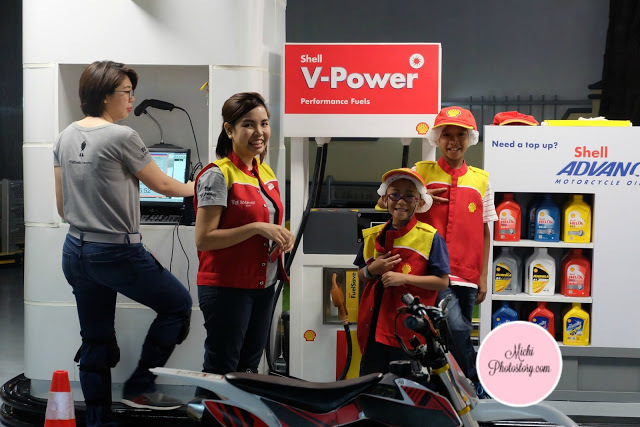 As a mom, I felt scared when my son said that he doesn’t like to work. Waah! I don’t like to raise a lazy man, one day he will have his own family and he needs to provide for them. I want him to have a family na hindi nakaasa sa parents. He said those lines too when I want him to register for McDonald’s Kiddie Crew Club last year. My husband told me, relax! Bata pa yan, hindi pa niya gaano maintindihan yan mga bagay na ganyan. Well, sana nga! So from first grading, his birthday celebration, semestral break, Christmas break up to fourth grading of the school year, I was asking if he wants to go to Kidzania, the answer is always no. 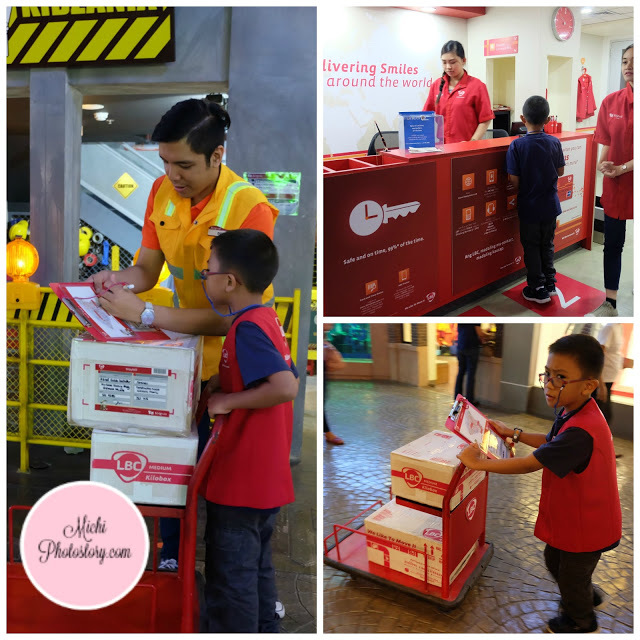 I follow Kidzania’s Facebook page and Instagram to keep me updated so when I saw that they have Art & Design Academy, I immediately told my son about it. Me: Di ba you like painting activity? 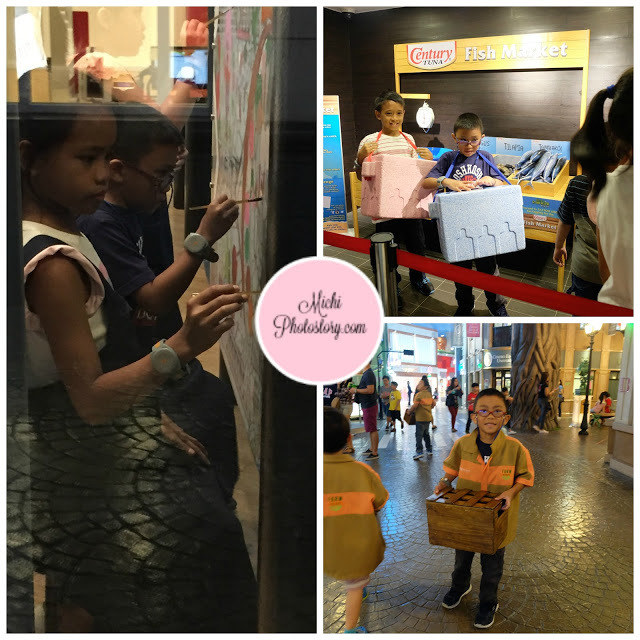 Check these pictures o, you can paint in Kidzania. 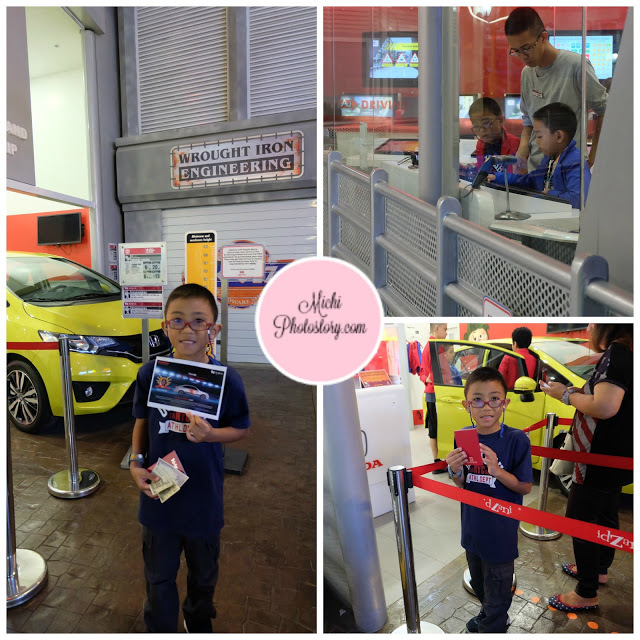 After several months of persuading my son to go to Kidzania, he finally said yes. 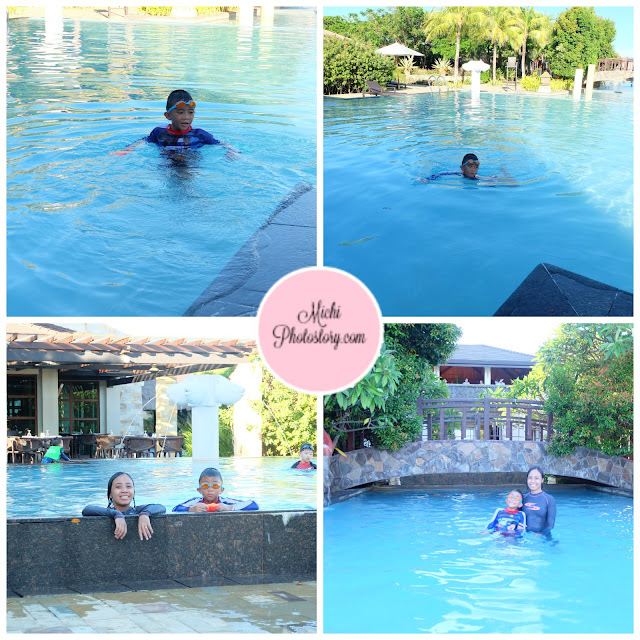 We’re supposed to go here last April 21 for my niece birthday celebration but we went to Cebu and my nephew got sick so we moved it to April 28. 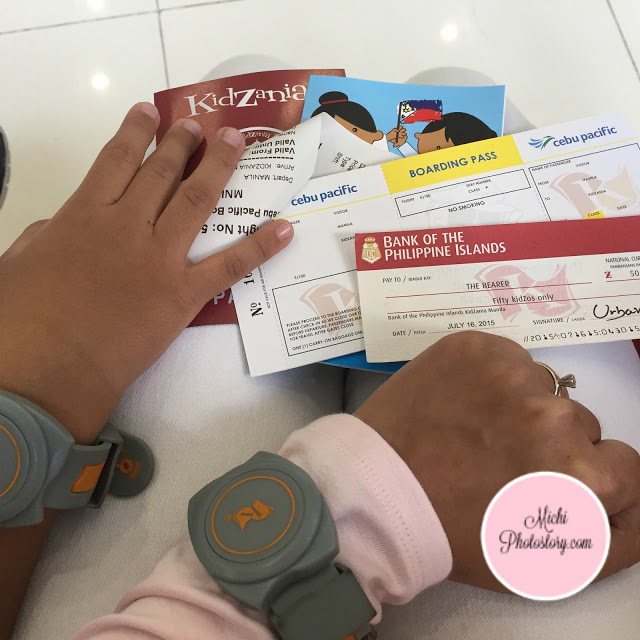 We were there as early as 7:15AM, sumabay kasi kami sa pasok ni hubby sa office so he dropped us in Kidzania Manila and we waited till 8AM (ticket counter opening time). We bought our ticket and the staff placed a security bracelet on our hand and gave us a boarding pass and check. Then we waited for my sister’s family. 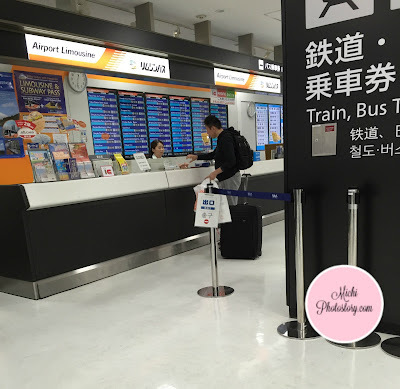 Upon boarding, the staff gave us the map so we checked the different activities while waiting for the opening. 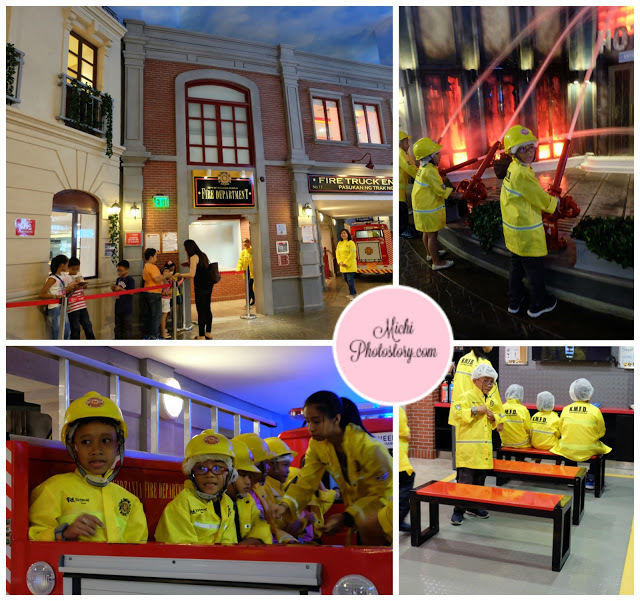 Though I’ve been seeing pictures of Kidzania Manila in Social Media and even TV, I was still amazed when I saw the mini buildings, establishments and even transportations up close and personal. It is like a mini city where everything is walking distance. I wish meron ito nung bata pa ko. Hehehe! 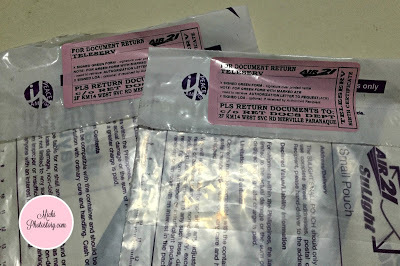 Then after the first activity, we went to Pazzport Office to avail the CitiZen Pazzport for P250. Being a CitiZen, you will have more benefits like earning more Kidzos or paying fewer Kidzos. (+2 and - 2 Kidzos). You get a discount at Department Store, National Store, and Photography. You will receive emails about the special offers and publications and you can check your resume online. You will get a stamp for each establishment that you will visit. Sayang lang, we have no stamp sa Fire Department kasi inuna namin. I told my son to work first so he can earn more Kidzos, so the second job is at 2. Courier Service, my son said “Hirap nito mommy” hehehe! At least he knows what job he doesn’t like. After working so hard, it’s time to spend some Kidzos; my son went to another in-demand job which is 9. Pilot. Sayang lang I don’t have photos because I cannot go inside and I cannot see him outside. 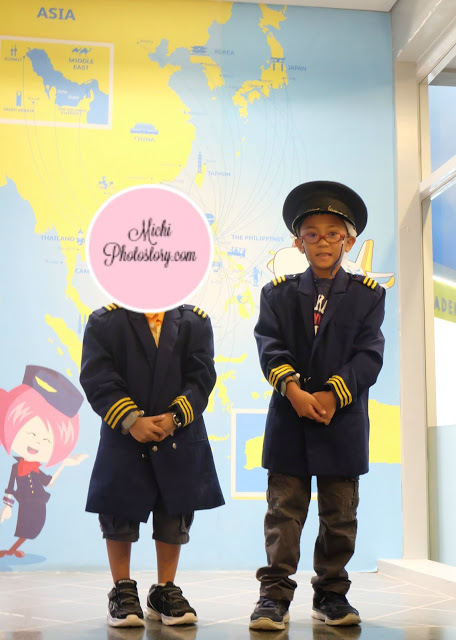 I went to Photo Studio so I can buy pictures but he has no picture inside the Aviation Academy. He learned 10. how to make pizza and we ate it too. Click here for the video. We went back to Car Design and Dealership so he can apply for 11. driver’s license and I was proud of him because he passed the test. May bumabagsak pala sa exam na yan. Buti pa anak ko my driver’s license na. Hehehe! 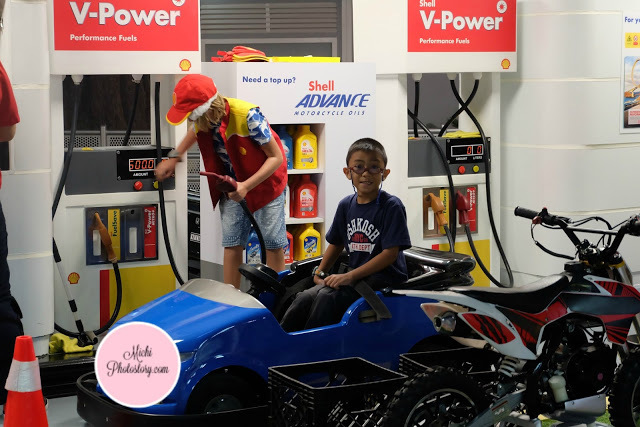 Then, of course, we went back to Gas Station so he can 12. drive the car. Remember, you cannot drive the car without the license. Then his last activity at the Automotive is 13. Car Designing and he got a print out of his masterpiece. After spending Kidzos, it is time to work again so he went to 14. Fish Market, 15. Art Academy and 16. Farm House Store. We were there from past 7AM til 4PM but we did not notice the time because we really had a good time. We were so glad that we were able to do 16 activities during our first visit and I can definitely say that we will go back again. We were not able to open saving account in the bank because of the limited time so dinala na lang namin pag-uwi. We ate at McDonald while waiting for my husband, 5PM pa out sa office so matagal na paghihintay. 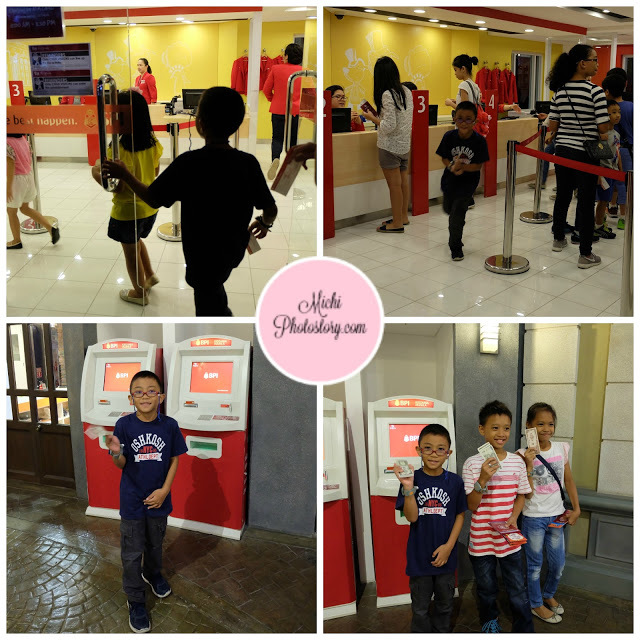 Lol My husband was teasing my son, “Akala ko ba, you don’t like Kidzania, bakit babalik pa” hehehe! Lesson learned, don’t say no, try it first. Our family loves to travel but if you are an old follower of this blog, you will notice that we only visit those countries that do not require a visa. We always travel on a shoestring so applying for a visa is still an additional cost. There are so many countries that Filipinos can travel without a need for visa application. In addition, I’m so scared that my visa will be denied. I dislike wasted time, effort and money for visa application. But I cannot deny that there are countries that I really want to visit that requires visa including Japan. 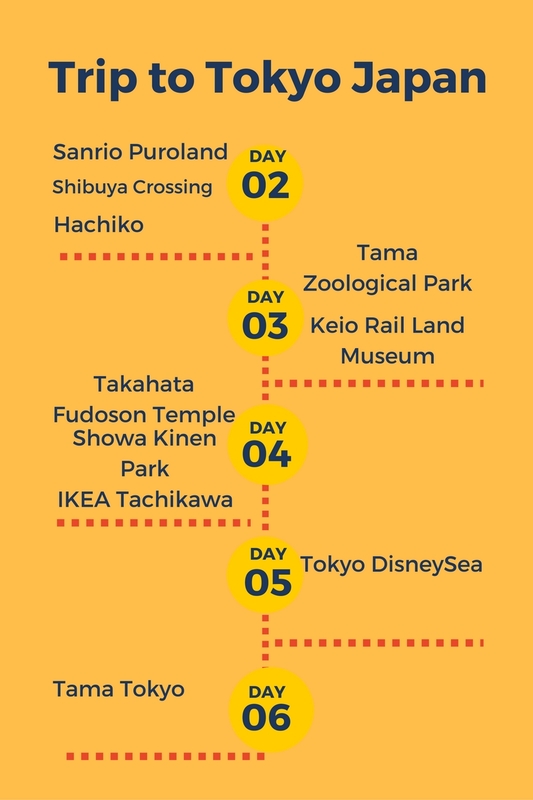 Japan is on my bucket list because I want to experience Cherry Blossoms but I was not able to experience it because my husband’s training was rescheduled. It was supposed to be April 4-6, then it was moved to April 25-27 but because of the Golden Week, it was rescheduled again. So no more Sakura for us but of course I still want to visit Japan. My husband sent me the list of requirements for Japan Tourist Visa and I immediately checked the list. I was sad at first because we need NSO birth certificate and marriage certificate that is valid within the year. Thank God that the training was rescheduled so I have enough time to prepare the requirements. - Must have at least 2 blank pages left in the passport. I informed the photographer that I need a picture for Japan Visa and we were surprised when we got the pictures, nakaformal clothes na kami. Applicants holding (old or valid) passports with used Japan Visa will be exempted from submitting a birth certificate. In case of non-record of registration of live birth. - Non-record in the NSO. 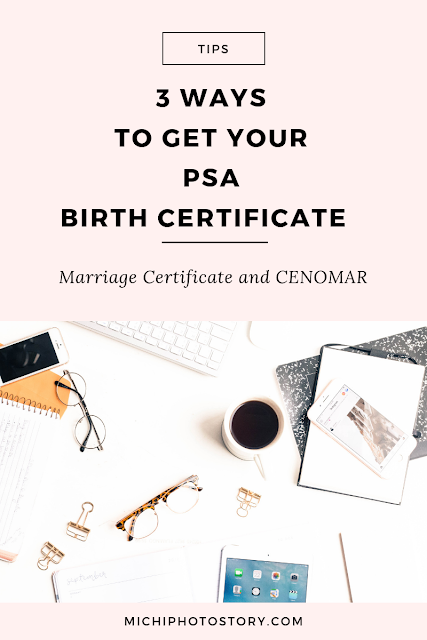 Need certificate of Non-record from the NSO and Birth Certificate from the Local Civil Registrar. - Non-record in the NSO and Local Civil Registrar. Need certificate of non-record from the NSO and the Local Civil Registrar. - Original Baptismal Certificate, School Record (Form 137 or report card) School Year Book. Applicants holding (old or valid) passports with used Japan Visa will be exempted from submitting of a marriage contract. In the case of non-record. You must submit a certificate of non-record together with the one from Local Civil Registrar. Prepared by the applicant or the travel agency. Followed this format. 7. Bank Balance Certificate or a Copy of bank Book Pages for the past two years. 8. Income Tax Return (Form 2316 or 1701) original and 1 photocopy. 6. Bank Balance Certificate: I have my own savings account but I submitted our joint account just to be safe since I am not working. April 19: My husband submitted the requirements in their travel agency. He got an email a few days after, the travel agency was asking for his Income Tax Return, maybe because I did not submit ITR. My husband was applying for Business Visa and ITR was not on his list. April 26: He submitted the ITR. April 28: He had a personal appearance (interview), it is a requirement for Business Visa. The agency put our application in one envelope even we are applying for a different visa. 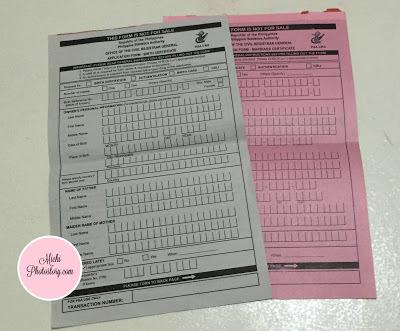 May 3: My husband was advised that our passports are ready for pick-up. He advised the staff to deliver it to his office. May 4: We got our passports. Visa approved. Yehey! The handling fee depends on the travel agency, in our case napamahal kami. My husband submitted our requirements to their company accredited travel agency, then the agency submitted the requirements in Friendship Tours and Resorts Corporation. So when I learned about this, I told my husband, “Ako na lang kaya mag-apply, sayang yung bayad kahit ako na magbayad ng Business Visa mo mas makakamura pa rin tayo.” Sobrang mahal ng handling fee, libre nga lang Japan Visa. But my husband didn’t like the idea na hiwalay pa pagprocess and he reminded me na first time ito, sige ka baka madeny pa. He even said, wala na ko time mag-asikaso pa, may schedule interview na ko. Ok fine, lunok na lang sa gastos. Total damage is P7,165 for 2 pax, kung ako nag-ayos P3805. 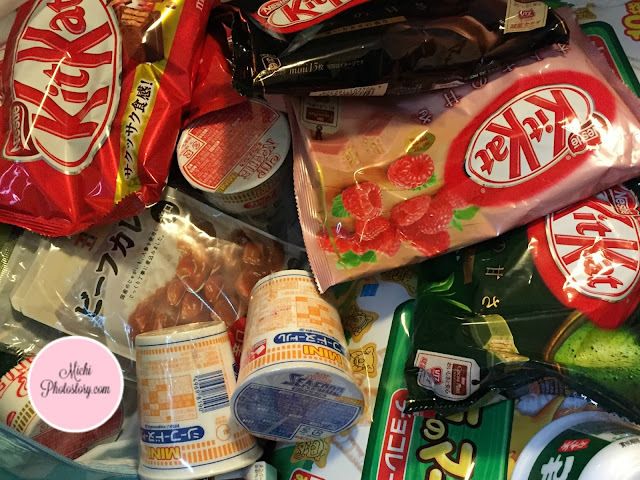 If ever we will go back to Japan, ako na mag-apply para mas tipid. 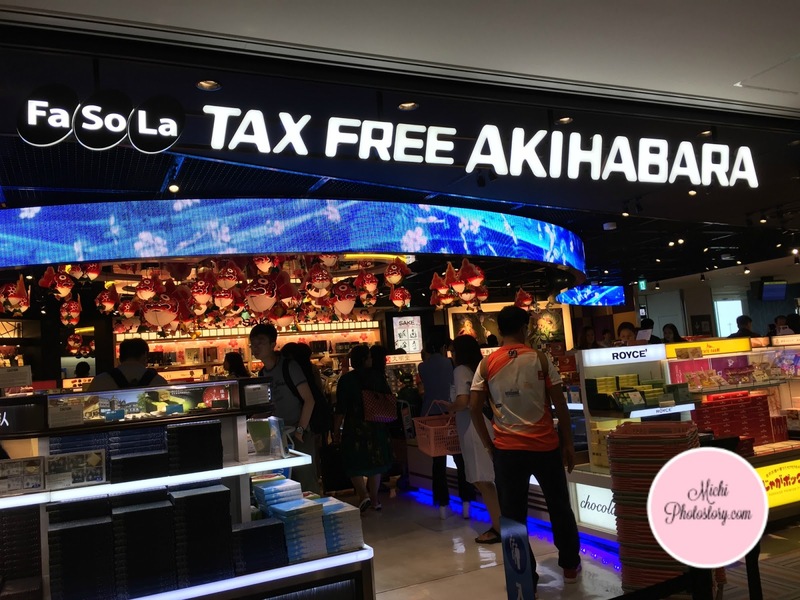 Tip: You can also take advantage of the sale at Travel Expo, travel agencies are offering Japan Visa and Korean Visa for as low as PHP500. 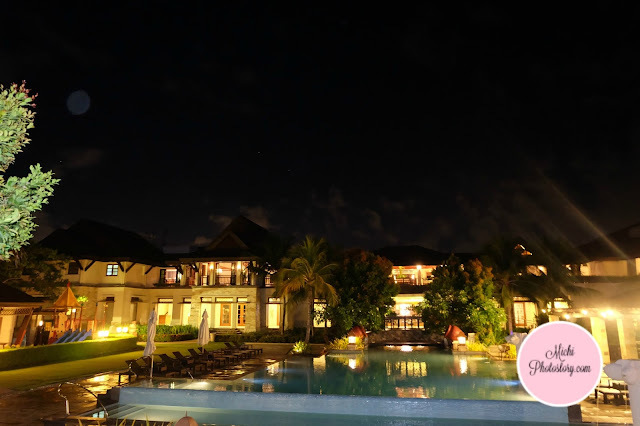 If you stay in Crimson Resort and Spa Mactan, you don’t have to worry about food because they have different restaurants that can satisfy your wants. 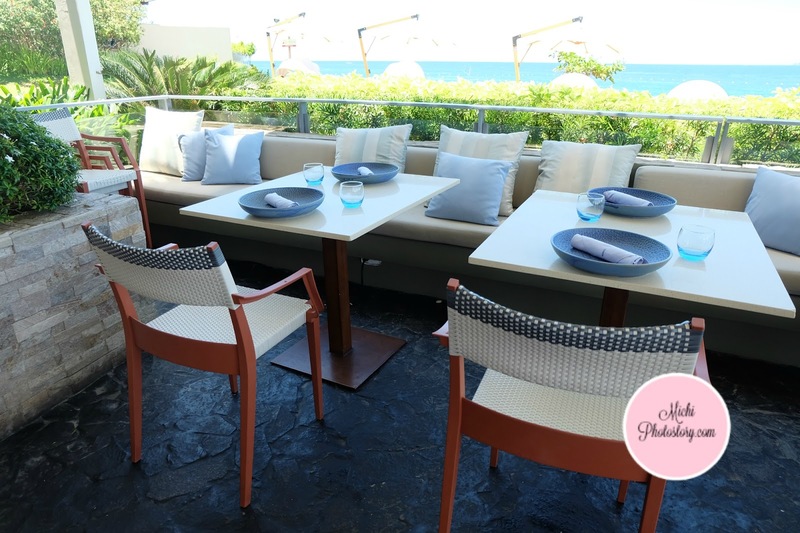 You can choose from Azure Beach Club, Tempo Lounge, Saffron Cafe and Score Sports Bar. They also have a Pastry Shop where you can buy bread, pastries and other desserts. In short, you will never get hungry inside the resort but of course the price is not budget friendly. Hehehe! During our overnight stay, we ate at Azure Beach Club and Saffron Cafe. 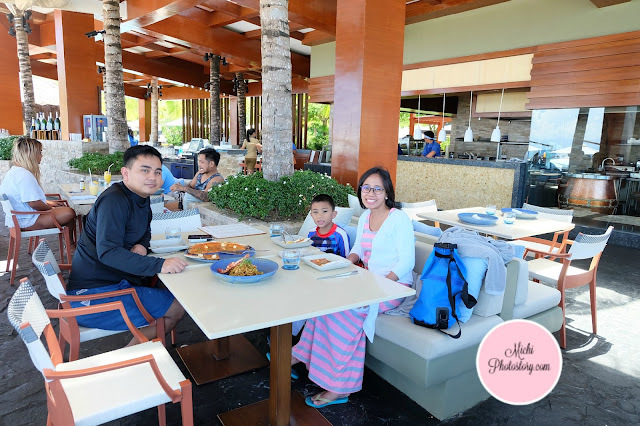 While waiting for our room, we had lunch first at Azure Beach Club which is located at the beach front. The location is very relaxing because you can see the seascape. 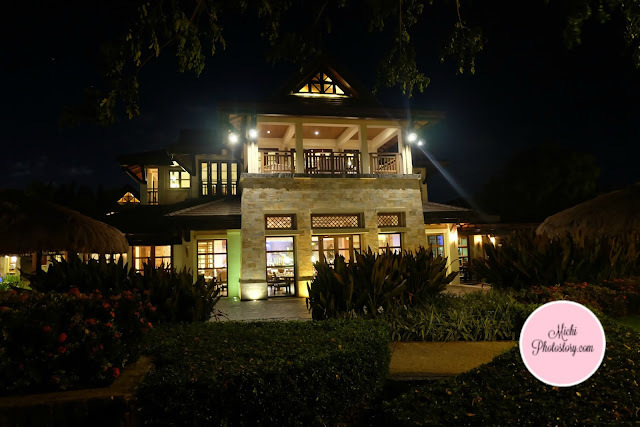 The restaurant offers different Asian cuisines, we had a hard time choosing food because I’m not sure if my son will like it. Just to be safe, we ordered Bollywood Pizza P410 ++ and Mie Goreng P390 ++. While waiting, they gave us complimentary mixed nuts. We were surprised to see the food because it is really good for 2 to 3 persons. At that time, my husband’s officemate in Cebu invited us for to attend his birthday party in Mactan. (it just so happened that we were in Cebu and birthday celebration niya) But because we’re so tired already and we don't want to go out anymore, my husband declined and we just ate at the resort. Goodbye free dinner. Hehehe! We had late dinner at Saffron Cafe because we wanted to finish the Pilipinas Debate first. It was past 9PM so it was really late but thank God the restaurant was still open. We ordered Crispy Pata P700++ and extra rice. The meal is already enough for 3 persons. They served us complimentary bread while waiting. Our room package includes free buffet breakfast at Saffron Cafe. I was happy with the buffet spread because they have a lot of choices here compared to Crimson Hotel. We left with a happy tummy. Our family loves Filipino foods so we always go back to Saffron Cafe. While browsing the menu the staff asked us if we want Children’s Menu. 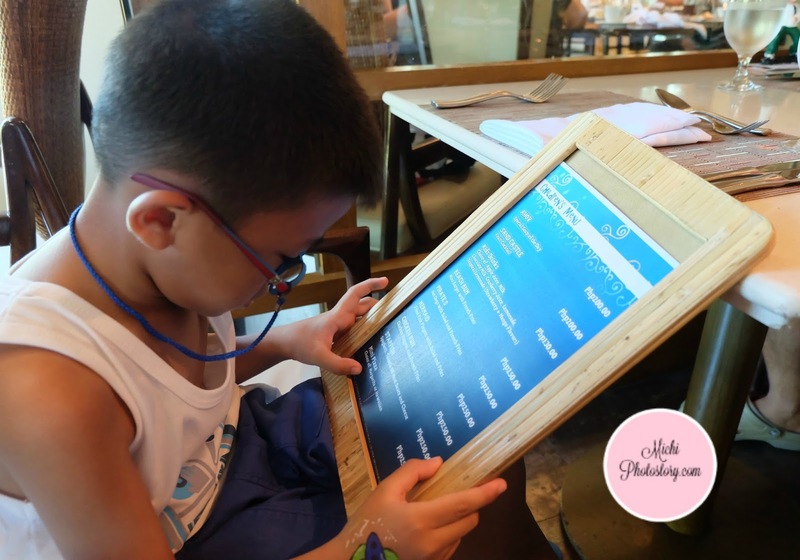 Akalain mo may kid’s menu pala, it was not offered to us when we ate dinner. 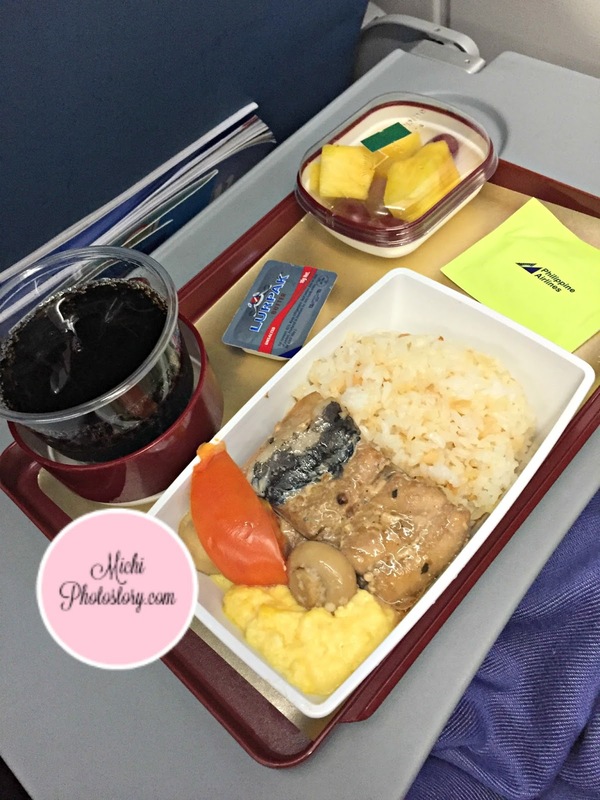 We ordered Kare-Kare P650++and Chicken Run P250 ++. While waiting, they served us complimentary bread and mushroom soup. Saffron Cafe offers buffet breakfast, lunch and dinner but since we are not big eater and we are on a budget, we chose ala carte. Anyway, we enjoyed our food trip in each restaurants and we’re satisfied with the service. 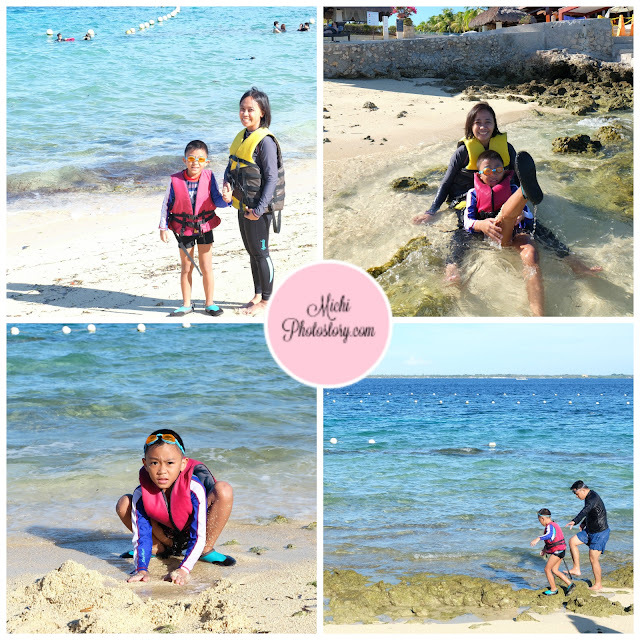 Planning for a vacation is not easy because it takes time to research and to decide which activities that you will include in a day especially when you have kids. 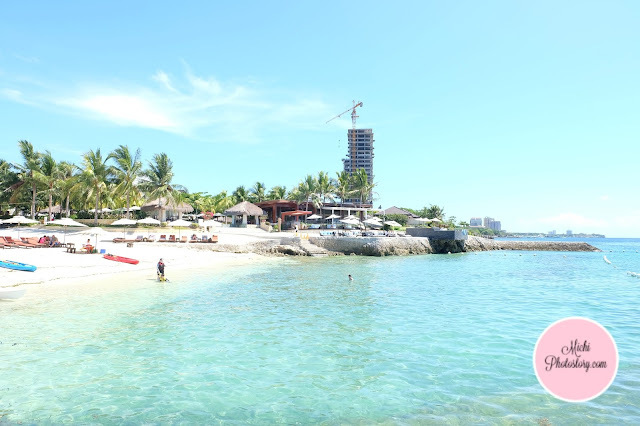 You also have to consider the location, facilities and amenities of the hotel or resort. Thank God that we reserved a room at Crimson Resort and Spa Mactan because my son really enjoyed our staycation. My son loves staycation, he gets excited every time he sees me packing for a short getaway. He really remembers those activities that he enjoyed and he always asked me if I take videos or pictures because he wants to see or watch it over and over again. 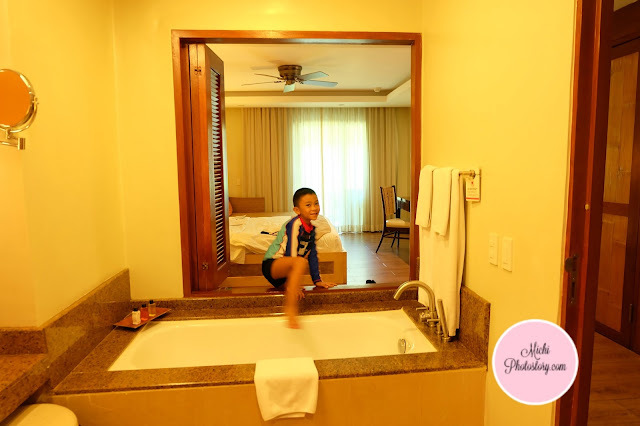 As of now, he can’t forget our recent staycation in Crimson Resort and Spa Mactan. 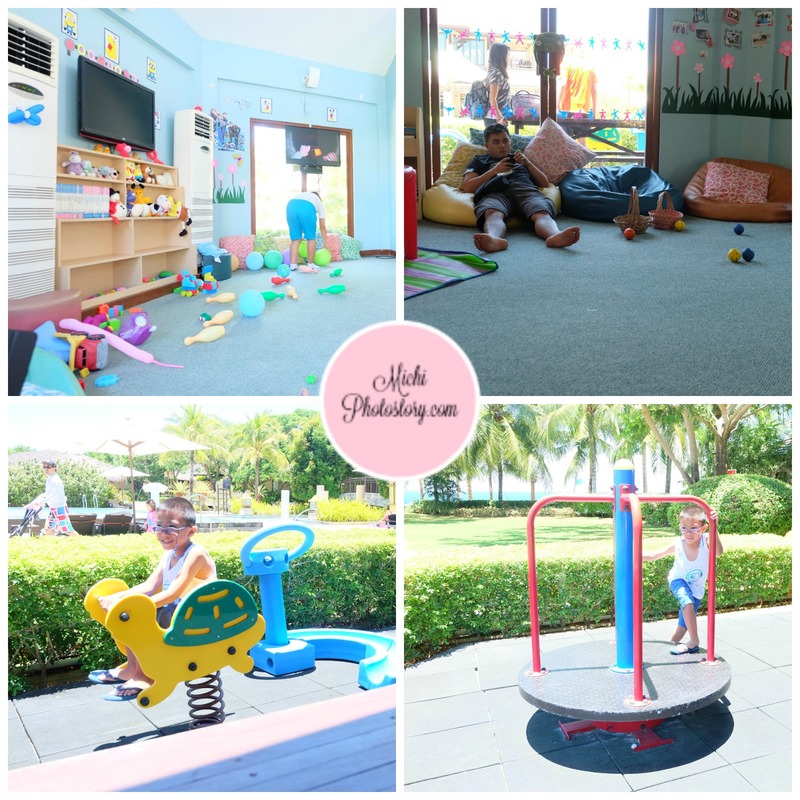 One thing that I like in this resort is the CrimZone, it is the comfort zone of kids. I’m pretty sure that kids will not get bored even you stay in the resort for few days. If you want to have time for yourself, you can leave your kids here for a fee or just stay and bond with your kids. Read: Staycation: Crimson Resort and Spa Mactan. 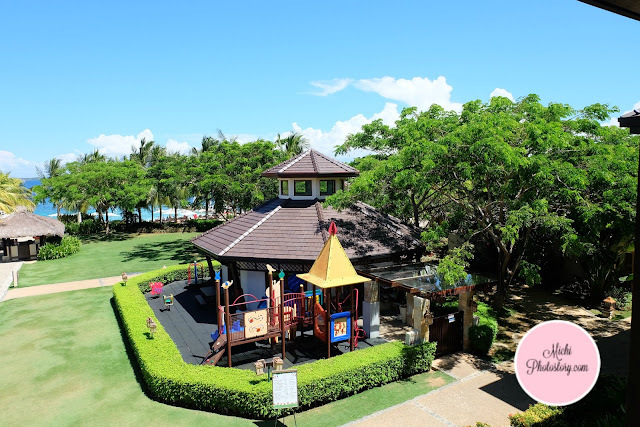 If you are planning to book in this resort, this post will give you an idea of the different activities in CrimZone. Every morning you will receive a piece of paper to inform you the schedule of activities for that day (adults and kids). If you don’t want to bring the paper with you, just visit the CrimZone and check the whiteboard for schedule. During our first day, we immediately checked CrimZone. There were slides, merry-go-round, toys, books and TV for movie marathon. Actually, my son forgot that we will swim so I have to remind him that we need to go to the beach and we will just go back to play area tomorrow. Parang ayaw na niya umalis, hehehe! The following morning, as promised; we stayed in CrimZone after we checked-out. Sharing with you the activities that my son joined. First activity is face painting but my son prefers hand painting. Hehehe! 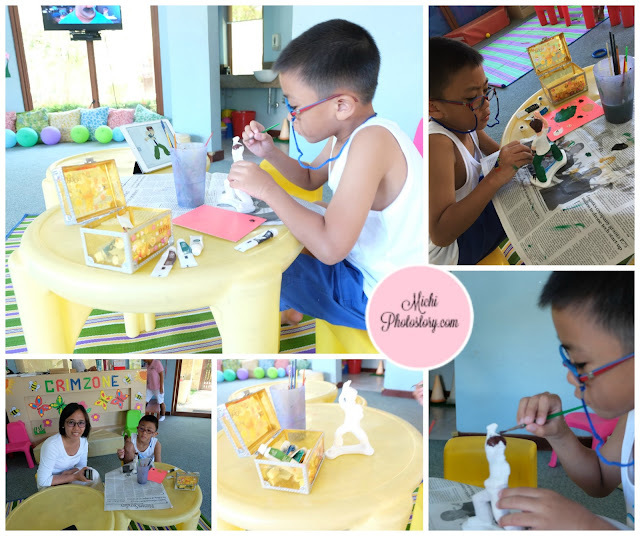 We missed the 7:30AM Figurine painting activity but I was glad that we can still avail this activity. The activity is not free, you have to pay P250 but you can take home the finished project. If you’ve been following this blog, you know that my son loves to paint. So he paints while watching movie. In the end, I already helped him because we want to eat lunch na and hindi pa siya tapos, though finishing touches na lang naman. Hehehe! My son and I loves watching Amazing Race so we really waited for this activity. We have no idea that there will be a prize for the winner and my son won the Amazing Kid’s Race. 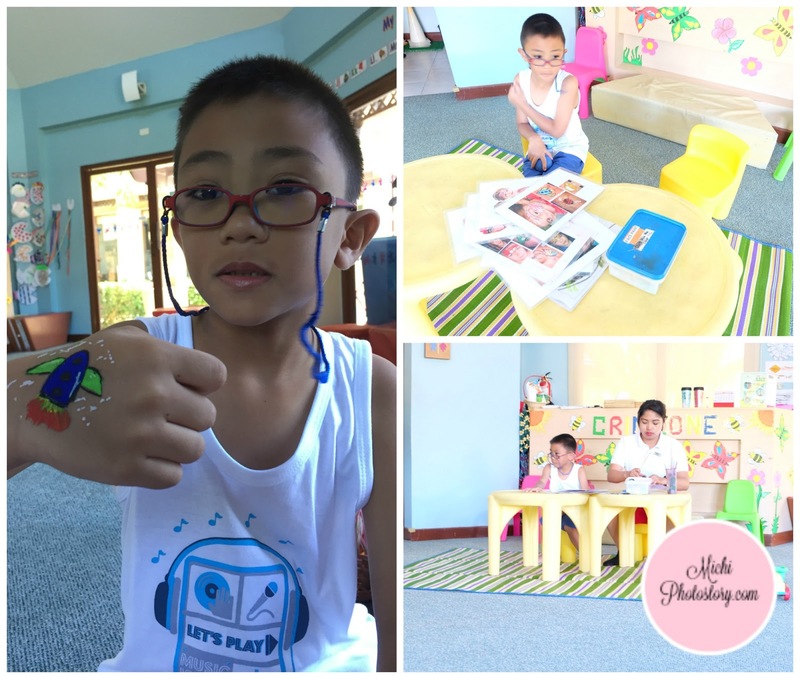 The prize is 15 minutes kayak or bracelet making, we chose the latter because my husband and son doesn’t want to change clothes na. Everything was packed na rin kasi. This was an easy activity, all he needs to do is put his chosen beads and the staff will be the one to tie it. Voila, he gave me the bracelet. Hehehe! 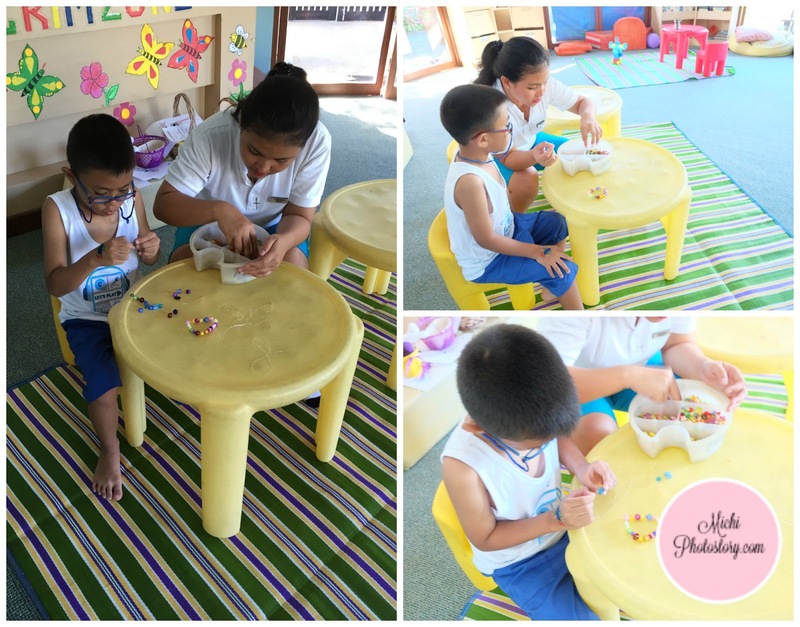 Bracelet making activity is P125. My son wanted to join the Obstacle Course but we have to say goodbye to CrimZone because we need to go to the airport. Two years ago I celebrated my birthday in Crimson Hotel in Alabang. 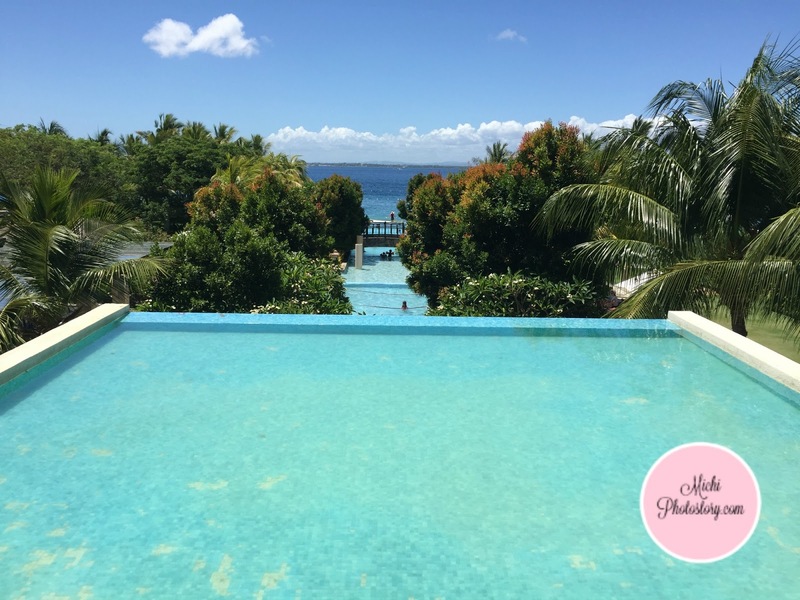 I had a great time during our staycation so when I learned that they have a branch in Cebu, I immediately added it to my bucket list. 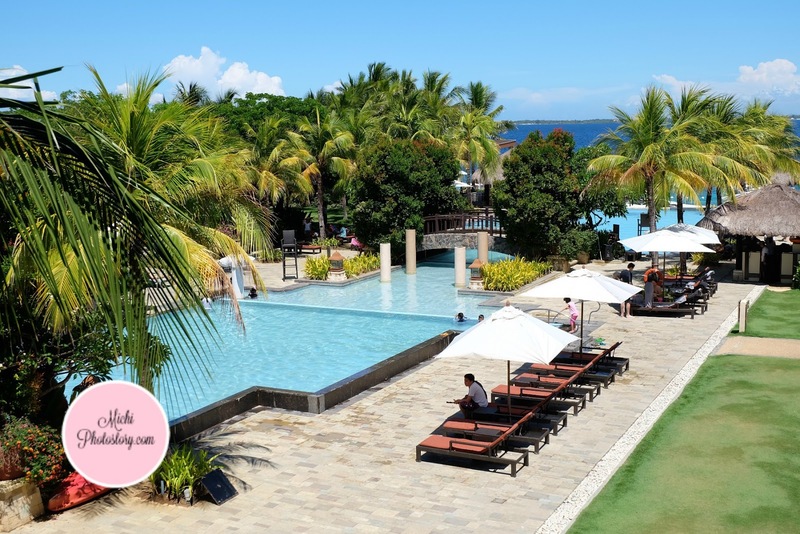 Last month, while I was planning for our Cebu itinerary; I decided to have a Day Trip at Crimson Resort and Spa Mactan. I inquired about the rates and they immediately replied. But few days before our trip, our plan changed and my husband called Crimson Mactan to reserve a room. 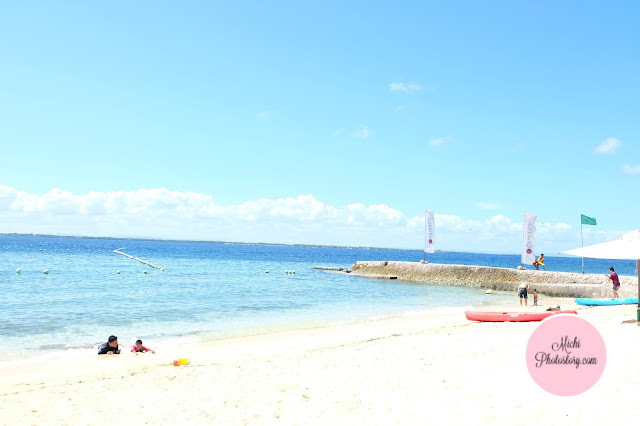 If we can’t go to Bantayan Island then go to Mactan. 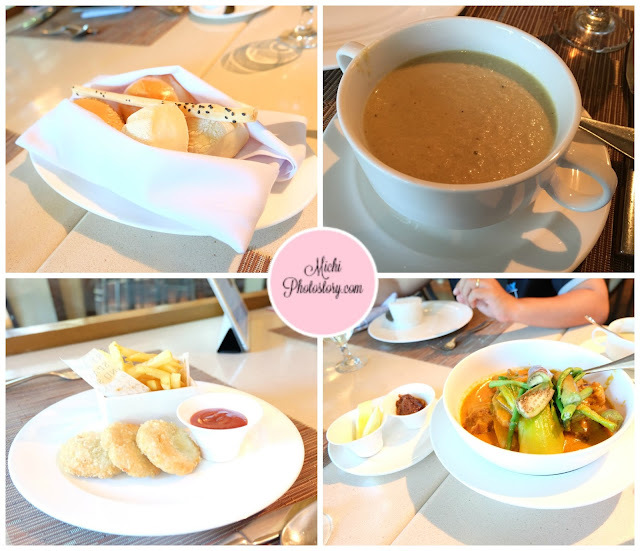 After our breakfast in Cebu Parklane International Hotel, we already checked-out and off we went to Crimson. 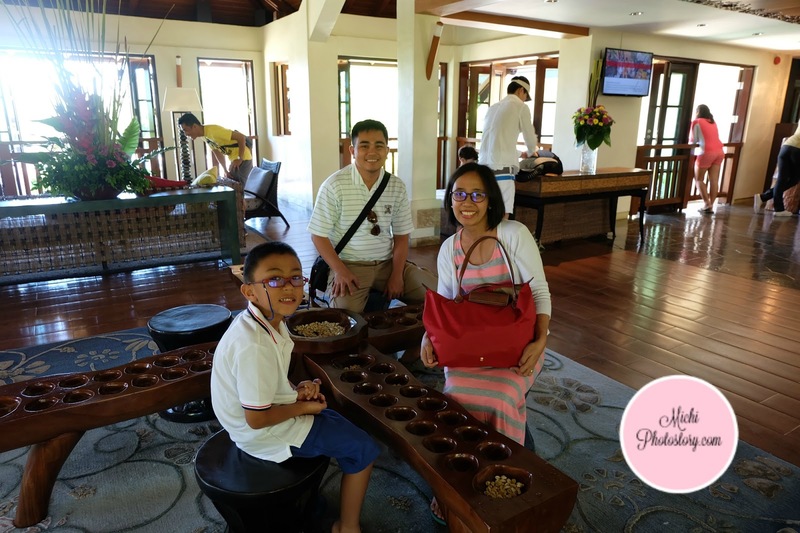 We arrived past 10AM, my husband gave our confirmation voucher and our ID’s; while waiting they served our welcome drinks and we played sungka. We had fun playing sungka, it’s been a long time that I haven’t played this game and I’m really looking for this toy. San ba pwede makabili? As expected, room was not available yet but we are allowed to use the facilities. The staff gave us resort map. We left our luggage in the concierge and went to the locker room so we can put our valuables, P500 deposit which is refundable. We roamed around the resort looking for an available beach chair but unfortunately, no available chair. We decided to have lunch Azure Beach Club. While waiting for our food bill, the staff called and informed my husband that our room is already available. Yey! Early check-in (past 1PM). We paid (via credit card) our reservation before we went to Cebu because pre-payment (one night stay) is required to reserve a room. 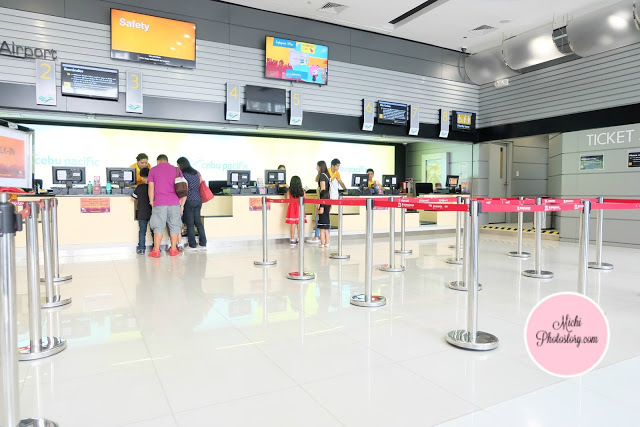 Additional P3000 for incidental deposit upon check-in. 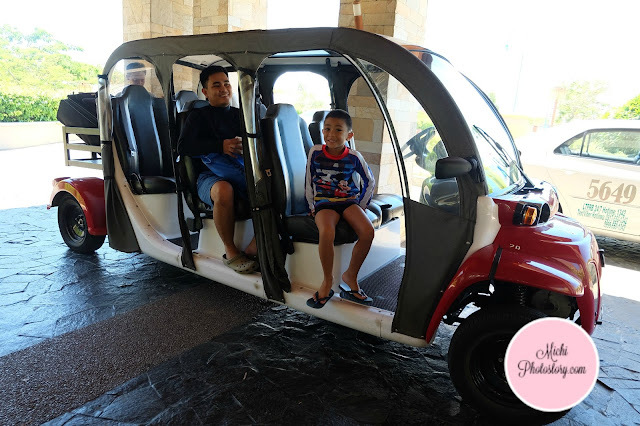 The staff gave our key card and we went back to the concierge to get our luggage and we rode this golf cart on our way to our room. Let us have a room tour. The bathroom has this folding door/window that you can open, I love this because I can see my son while playing in the bath tub or you can also watch TV while inside the tub. They provided basic toiletries like shampoo, soap, bath gel, lotion and dental kit. The fridge has complimentary drinks and snacks (one time only). Two softdrinks in can, 2 beer in can, 2 bottled water, 1 Peanut Kisses and 1 Kitkat. We just took a rest first and off we went to the beach. The beach was still packed, ang hirap makahanap ng bakante. 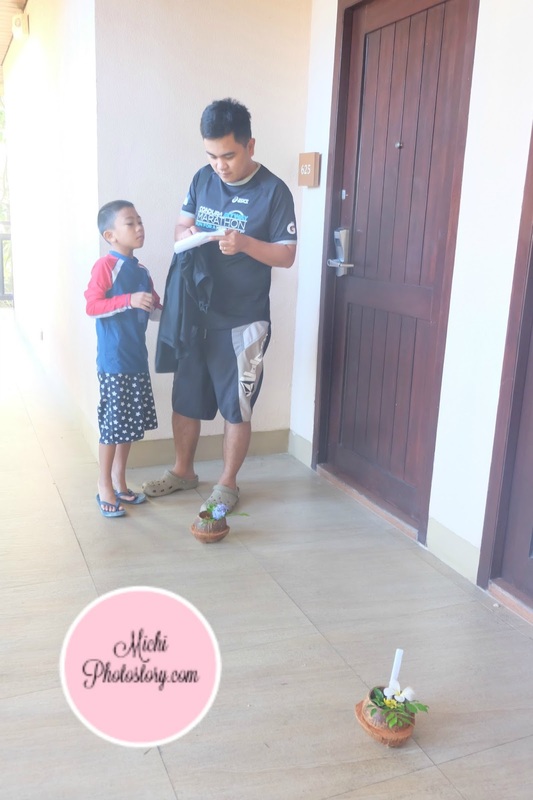 Don't forget the swimming shoes at mabato yung beach. We all know that the sand was imported somewhere just like in other resorts in Mactan. We transferred to the pool because the beach was closed already. We had late dinner at Saffron Cafe because we watched the Pilipinas Debate. We missed the event at the beach tuloy kakapanood. Hehehe! The following day, we were surprised to see a note in front of our door. It was a piece of paper where the time and activities of the day were listed. This is nice because you can plan your stay. 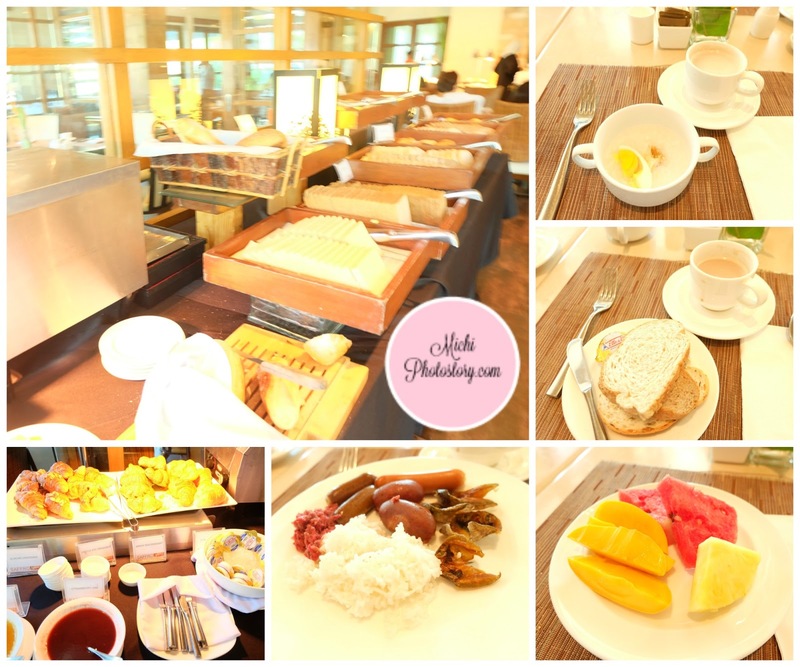 Then we went to Saffron Cafe for our free buffet breakfast. The buffet spread is better than the Crimson Hotel because they have more choices here. After eating we went straight to the beach, I was glad that it was not packed as yesterday. It’s Monday so I guess, most of the guests already checked-out. We killed our time here while waiting for check-out. There are beach toys that you can borrow. We went back to the room to prepare because the check-out time is 11AM. Our flight was 8PM so we still stay inside the resort, again we left our luggage in the concierge and bags in the locker. We stayed in the CrimZone so my son can play and join different activities like face painting, figurine painting, Amazing Kid’s Race and bracelet making. I will share it in a separate post. Before going to the airport, we had quick shower. So if you want to visit Crimson for a day, don’t worry because the bathroom is clean. On our way to the airport, the concierge staff asked our flight time because taxis are not always available, he gave us 3 options. But thank God at may napadpad na taxi. Hehehe! 1. We like the room because we have enough space to move around. 2. We have complimentary drinks and snacks. 3. 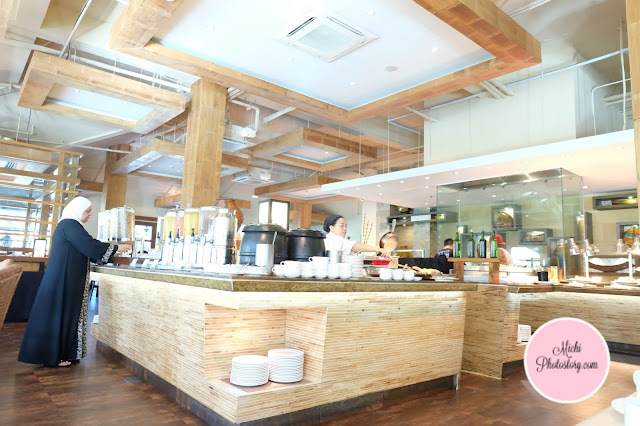 The service is good especially in the restaurant, CrimZone and reception. They are all friendly, approachable and they always smile. Some even volunteered to take our family picture. Even the housekeeping staffs and gardeners greet us. There is one lang in the concierge na medyo off sumagot. He said, “Paano kayo papasok kung wala kayo key card”. Hmm, di lang agad napakita yung keycard at namisplace, may side comment na ganun. 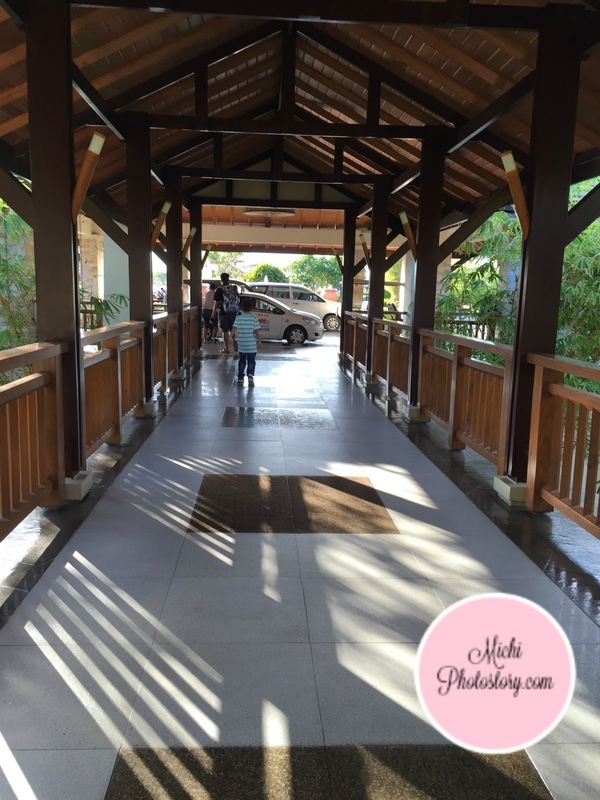 We stayed in other luxury hotels and resorts and first time ito. He even stayed in our room na pagkatagal-tagal na parang waiting for tip. My husband just said that he left his bag at the locker (which is true) so wala siya maabot but the truth is kahit may wallet because of your attitude, no tip. 4. The waves in the beach are unpredictable but they provided life vest for guests. I did not bring any toys so I was glad that there are available beach toys that we can borrow. 5. 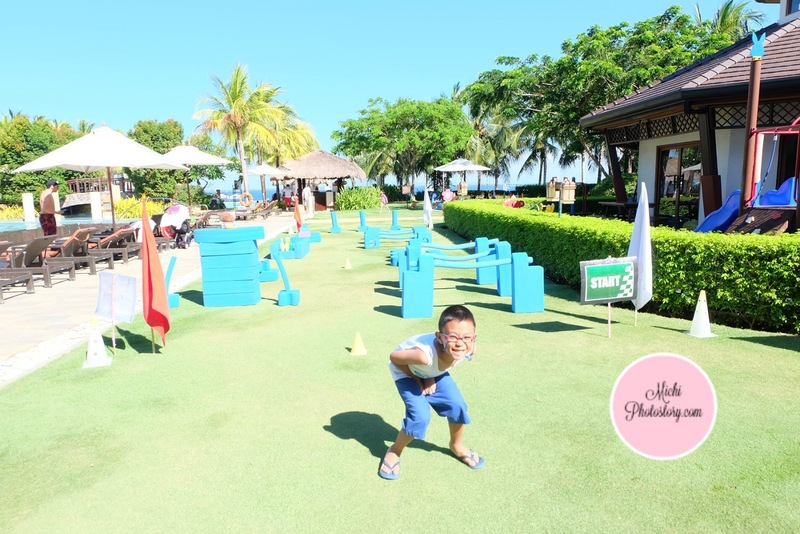 There are so many activities for both adults and kids every day so you will not get bored. Hmm, the staycation is almost perfect kung di lang dun sa isang staff sa concierge. The only thing I don’t like here is the price, hehehe! It is expensive so even we want to stay long, nakakabutas ng budget. 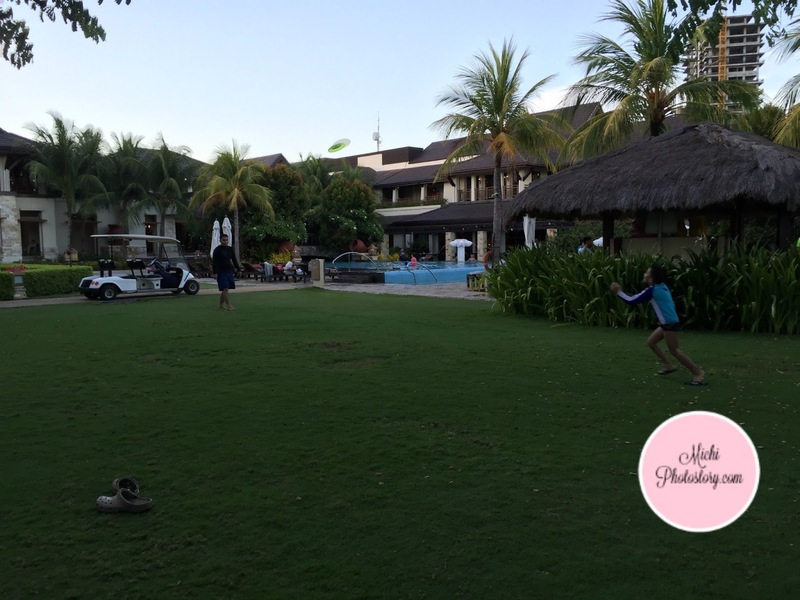 I suggest that they have staffs in the beach or pool area that will supervise, we experienced that in Shangri-la Mactan Resort and Spa. After the guests left, they will immediately pick up the used towels and prepare the beach chair for the next guests. So guests have an idea that the beach chair is really available. In Crimson, di mo alam kung wala na ba tao o pang reserve nila yung used towels dun. hehehe! 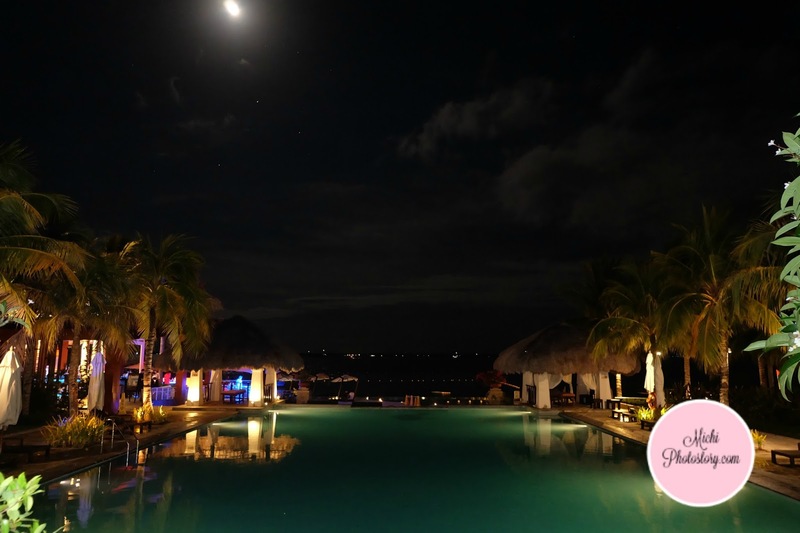 We really had a great time in Crimson Resort and Spa Mactan , I even told my husband na bitin ang 2 days and 1 night namin. I hope next time kahit 3 days and 2 nights stay.